Today’s kitchen and bath spaces encourage more creativity in surface selection than ever before. From natural stone and wood to concrete and recycled glass to manmade composites and laminates, an array of stylish options are available for every design preference and budget. In fact, with so many options from which to choose, a growing trend is to mix several types of surfaces within a space to provide contrast and visual interest. So, what factors are most important when choosing surfaces for the kitchen and bath? Durability. Kitchens and baths are typically some of the busiest spaces in the home. As such, it’s important to consider what type of wear-and-tear a space will be subjected to before making a decision on surfaces. Selecting a material that is durable while requiring minimal maintenance will help to ensure that the surface can be enjoyed for years to come. For example, natural stone surfaces such as granite and quartzite are both hard wearing and heat resistant, making them particularly well-suited for countertops, islands and backsplashes. Aesthetic Appeal. Because kitchen and bath surfaces aren’t likely to be changed frequently, it’s best to choose surfaces that won’t wear out their welcome. While neutral color schemes remain popular, there is a growing trend toward incorporating surfaces with interesting patterns and colorations for a more dramatic look. The choice ultimately comes down to personal taste, although – if a homeowner doesn’t plan to stay in the home for more than a few years – resale value should be considered in the final decision. More neutral hues and designs can be a safer bet for resale. When we consider surfaces for the kitchen and bath, we typically think first about horizontal surfaces such as countertops, vanities, islands and flooring. However, it’s important also to consider vertical elements and how the creative application of materials such as natural stone can bring these areas to life in bold and unique ways. The interesting use of surface materials on backsplashes, walls and shower enclosures merges the best of function + form – not only helping to protect walls from moisture and splatter, but also delivering depth, dimensionality and visual interest. Available in a wide variety of materials and colors, backsplashes are a great place to play up style in the kitchen or bath. For those looking for a more dramatic look, accent walls can transform what are often viewed as utilitarian spaces into places of beauty and inspiration. For example, distinctive slabs of natural stone can be placed behind a bathtub or sink to create a dramatic focal point or be used as a stunning backdrop for a shower enclosure. Backlit stones such as onyx are particularly striking in this type of application. Mosaics, inlays, tiles and “book matched” materials provide another way to capture the eyes while also enabling individual expression through interesting patterns and color combinations. Whether choosing neutral hues to create a soothing, organic backdrop or opting to add a pop of color, the inspired use of vertical surfaces enables us to see kitchen and bathroom spaces in a new light. Q1) Do you have a go-to material that you use for backsplashes? Why that material? 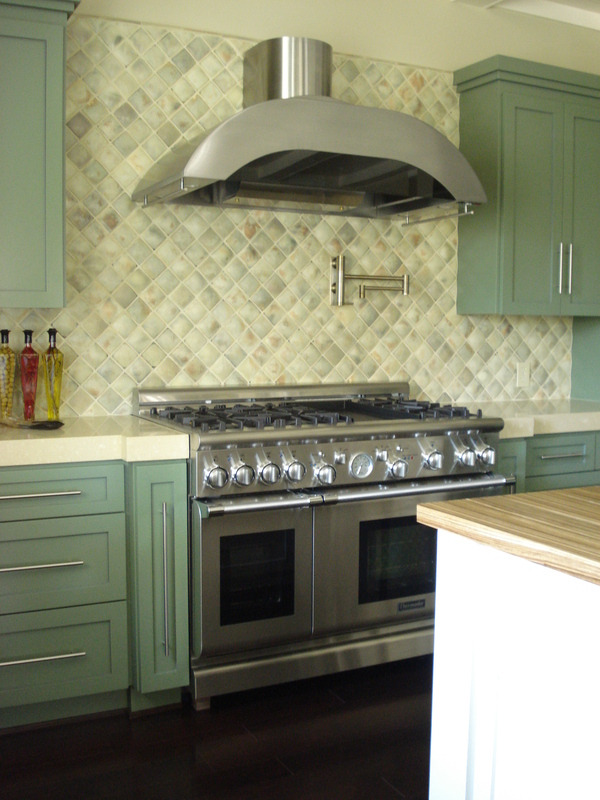 Q2) Solid backsplash or tile/mosaic (patterned) backsplash – what’s your preference? Photos please. Q3) When it comes to backsplashes/shower surrounds for the bathroom, what are your favorite materials? Q4) What are some of the most interesting kitchen/bath accent walls treatments you’ve seen? Q5) Standard backsplashes, ceiling height backsplashes – or something in between? Q6) For vertical surfaces, do you opt for neutrals or color? Matte or shine? Let’s see examples. Q7) What exciting new trends do you see for vertical surfaces in the kitchen and bath? Q1.) What cabinetry elements play with our emotions and make us want them? Decorative hardware or pull-outs? A certain style or finish? A beautiful layout? Q2.) The backsplash wall area is often a place to add bling to the kitchen. What is trending with backsplashes that is exciting? Q3.) What kitchen countertop materials and details add to creating a wow factor when entering the room? Q4.) Major kitchen appliances can offer much to to impress. What are your favorite ways to show them off? Q5.) What are your kitchen window and lighting tips for adding drama and beauty to the kitchen? Q6.) Kitchens are very complicated. Do you have any other kitchen design ideas to wow us? Please share! 1. ) What looks are trending now for backsplashes in the kitchen? Please share pics! 2.) What are your favorite materials for backsplashes in the kitchen? Why? 3.) What are your design solutions for ending backsplashes on return walls? On cabinet finished ends? 4.) Please share design tips and photos for backsplashes on cooking/ventilation walls! 5.) What backsplash materials/looks have you found inspirational or want to design in?